This project is named Cooking Fuel Alternative and Livelihood Development (CFALD). It addresses cooking fuel issue specifically through new approach in rice farming known as D.P Rice Farming Revolution (DPRFR) submitted under thematic for Rural Transformation and Zero Hunger. It is engineered on the fact that cooking becomes more and more challenge not only in Laos but also throughout the LDCs and developing world because conventional cooking fuel becomes harder to find and more expensive. In Laos, thing becomes even worse in recent years because the government makes logging illegal either for cooking fuel or other purposes. Nevertheless; the ban is not effective because people cannot cook and live without the conventional fuel as firewood and wood charcoal. As result, in 2018, though illegal, about 15,000,000 cubic meters of live trees were logged for cooking fuel in the country (2.50 m³/person). About 60% of the trees were processed for wood charcoal while the rests used as firewood. The demand and logging will certainly increase as population grows. These will put more pressure on the forest that has already been severely under threat. We saw the problem and developed technology specifically for cooking fuel production in 1990. It is simple and cheap but highly effective and sufficient because the machine itself is made of scrapped metal while raw material used in production of the fuel is paddy husk. The husk is grinded and heated up to about 400 degrees Celsius while pressing through metal pipe with screw pressure. Because of the heat, the husk generates sticky syrup and sticks together strongly even becomes artificial firewood after screwing through the pipe. The artificial firewood could be burnt for heating and cooking. However, it generates smoke though its sufficiency level is much higher than the firewood and wood charcoal. Therefore, we process the artificial firewood in well-designed charcoal kiln for artificial charcoal. The artificial charcoal, though it is made of waste, lasts much longer than the wood charcoal in cooking stove without smoke and ordure. It is highly suitable for both household and commercial cooking. Indeed, with the fuel we produce, restaurants and food vendors have increased 30% in net profit because of energy saving and sufficiency. On the other hand, women especially in rural communities have saved up to 3 hours per day in cooking choir and firewood gathering. Nonetheless, even though quality of the cooking fuel is much higher than conventional wood charcoal and firewood, its sale price is highly competitive and much cheaper than LPG. We strongly believe that if the technology is fully implemented as planned, we will be able to supply 70% of total demand for cooking fuel in Laos today because its raw material is paddy husk and very easy to procure. Indeed, 70% of population are rice farmers and about half of paddy field in the country is partly or fully irrigated. That means, in average, rice farmers could grow rice 1.85 circle per year. That will give us more than enough husk for the fuel production to supply 70% of the demand. Yet, the cooking fuel production will automatically encourage rice production and increase level of food security in the country. In addition, we device an apparatus to trap smoke at chimney of the charcoal kiln. Smoke pluming out of the kiln during processing of the charcoal is trapped and becomes tar. The tar then flows down from the apparatus through a pipe to drum set on the ground. The tar could be used for bio insecticide or processed further for methanol. See the picture attached. That means with the apparatus, there is little or no smoke polluting the air and environment. Moreover, the technology we have developed could be replicated anywhere in the world especially in area where rice farming is practiced and firewood as well as wood charcoal is used for cooking and heating. As result, more trees will be saved in many parts of the world and environment in general will improve. At the same time, good rice farming practice will be encouraged and food security level in the world will improve. Significantly, waste from grain mill will be minimal or even reduced to zero. Indeed, we developed the technology in early 1990 and it has been mobilized since. Originally, we used sawdust and waste wood as raw material. As time passed by, we gained more recognition and customer base grew. In 1995, we could not supply demand in full because many traders from Thailand handed us large order while existing domestic customers came onsite with trucks waiting for output. In 2010, sawdust became scarce because logging permit was limited by the government. As result, we shifted away from the sawdust and turned to paddy husk. However, though both the sawdust and paddy husk are by-products, the paddy husk requires larger scale operation and investment than the sawdust for acquisition. Fortunately; it (the paddy husk) offers much better business opportunities, big return, large social benefit and significant environmental improvement. It begins from rice farming because the husk is from rice processing. The rice farming, however, is a very big challenge in Laos today because it has failed farmers very badly even nobody wants to toil his/her land but leaves home to sell labor in towns and cities. Many of them cross border into Thailand and some never return. As result, rural villages today are only home to the very old and very young because working age population has left. Subsequently; staple food becomes scarce and expensive while food import rises. Yet, the situation makes Laos a big loser though it is very small and poor. Fortunately, CFALD could make differences through DPRFR submitted under thematic for Rural Transformation and Zero Hunger. We bundle the CFALD and DPRFR together to maximize benefit of humanity and the world. With large volume of paddy is produced and processed under DPFRF, huge quantity of paddy husk is generated because about 25% of paddy is husk. As result, we will have enough raw material for the fuel production. Nonetheless; to get full control of the husk supply, the DPRFR will mobilize rice farmers under Contract Farming Agreement (CFA). The CFA creates avenue for rice farmers to supply their outputs especially paddy to the DPRFR (project management) in exchange for cash and other benefits. 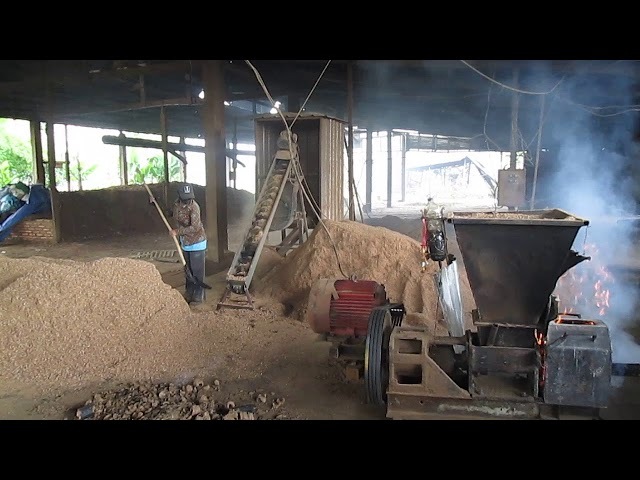 The project management (PROM) processes the paddy for commercial purposes in its grain mill and the husk will be used for the cooking fuel or artificial charcoal production. This is the only way to procure the paddy husk sufficiently and make the artificial charcoal production commercially profitable. Otherwise, we have to buy and truck in paddy husk from various grain mills. These will cause production cost to rise and make the output not competitive. On the other hand; with linkage between CFALD and DPRFR, purchases of raw material (paddy husk) and every cost incurs before the fuel processing are born by DPRFR. Therefore, net profit and cash flow of CFALD will always look positive and more attractive to investors worldwide. In conclusion, CFALD is engineered not only for cooking needs, saving trees and improving environment but also increasing level of food security through DPRFR that concentrate on sustainable rice farming, rice farming sufficiency, integrated rice farming, processing and trades. However, to improve net profit and sufficiency, it should not be operated as stand-alone business.Therefore, it should be funded and implemented. After all, it serves the world with very basic necessity and improves environment.